Many teachers use flannel boards or magnetic boards for language activities, but overlook these useful tools when planning for math. Think how easy children will find counting the flannel pieces as they are added to the board. Show them how to count from left to right and from top to bottom, touching each piece as they say its number. Children can easily count the character figures that you use for stories, such as the bowls, chairs, and beds in the story of The Three Bears, the cookies in Little Red Riding Hood's basket for grandma, and the raisins on the Gingerbread Boy. Now it's time to introduce math skills with the use of rhymes and songs on the flannel board too! Many familiar fingerplays and rhymes add one character at the end of each verse. 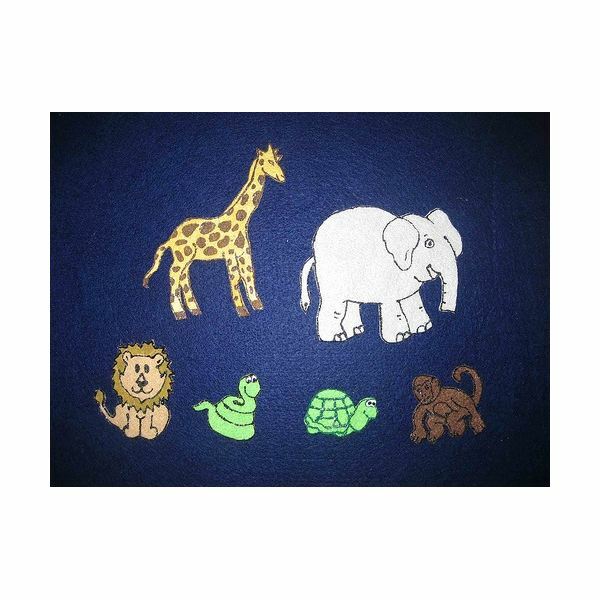 When you provide felt figures for these rhymes' characters, children can count up, adding by one as they recite the rhymes and play with the characters at the flannel board. One such popular rhyme/song is One Elephant Went Out to Play. Make up your own version of this song and create characters with felt for your flannel board. If you are using a magnetic board, the characters can be made with cardboard with an adhesive magnetic strip on the back. Here is an example of a simple counting up rhyme. Out in his yard one sunny day. That he called for another little dog to come. (Continue adding dog figures and counting up until you run out of felt characters). In other familiar rhymes, a character leaves at the end of each verse, and children count down – or subtract by one – as the rhyme continues. Think about 10 Little Monkeys Jumping on the Bed or Roll Over. For this popular rhyme cut out characters such as teddy bear shapes. Add eyes with a marker. Place a rectangular piece of felt on the board for the bed. Have the children count the correct number of bears on the bed quilt. They will be counting down each time a bear falls off the bed. You can make a variety of characters for the holidays and seasons and still use this same verse. Think about pumpkins, ghosts, snowmen, fish – or any pattern that is easy to make. Use songs as a source for pre k math ideas on the flannel board. For example, sing Old MacDonald and cut out felt shapes of animals on his farm and put them on the board as you sing about each animal. Together count all of the animals at the end of each verse, noticing that there are more animals than the last time you counted. Plan on more than one of each animal, so you can adjust the song. Sing "Old MacDonald had four pigs, E-I-E-I-O…" Have the children practice comparison skills by counting just the pigs, then the cows, chickens, and so on. Discuss which group has more and/or less. Take an animal shape or character and make duplicates in several sizes. Cut these from felt. Invite your class to practice seriation, another math skill, as they arrange the felt pieces on the flannel board in order from largest to smallest or vice versa. Encourage them to use words such as larger, smaller, taller, shorter, narrower, and wider. Cut at least two of each shape, size, and color so children can match items. These pieces can be geometric shapes, hearts, shamrocks – anything easy to cut from felt. Invite the children to sort/classify by color, size, or shape. As their skills grow they will begin to classify by two attributes (color and size), putting the large red shapes together and the small blue shapes in another place on the flannel board. Preschool math activities can be fun and easy when using a flannel or magnetic board. This is such a visual way to teach math skills along with using stories and songs to make these lessons a favorite among your preschoolers.